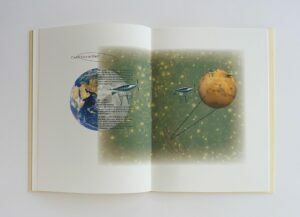 I interviewed Jackie Thomas about her handmade books that tell complex stories about science in pictures. Several international art galleries and book fairs have exhibited Jackie’s books. They include the London Art Book Fair, the Whitechapel Gallery, BABE Arnolfini in Bristol, and the exhibition ‘Art and the Quantum Moment’ at the Simons Centre for Geometry & Physics Stony Brook University, New York. Leslie: Can you tell us more, please, about your handmade, science-based books. 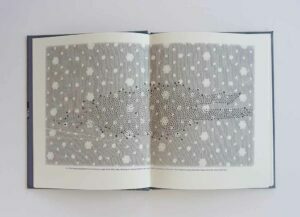 Jackie: I am passionate about the crossover between art and science so I began making my own books as a way of expressing my interest in the subject. These are really ‘artists’ books’, but offer a different way of looking at science related subjects; I call it ‘visual science’. I collect images from numerous sources, often old out of print books found in second hand shops, online, my own photographs etc, most of which are cut out and mixed up, overlaid or inserted into other images, creating a kind of digital collage. My subjects vary: some focus on a particular aspect of science, for example the discovery of electricity, or the development of the computer from the jacquard loom, others focus on a particular individual, someone who will have contributed significantly to science in some way. For example William Herschel, who was an astronomer, scientist and a musician, offered a fascinating subject for a book. By concentrating on some of his important astronomical discoveries and combining them with a completely non-scientific aspect of his life – in his case a well-known love of lace that he traditionally wore when performing – I combined images from both parts of his life to produce an unusual visual overview. I look for links, sometimes quite tenuous ones, to give me a kind of ‘hook’ that I can then build on. I also create a kind of visual ‘narrative’ and continuously ask myself the question, ‘what is the book about?’ For me it is not enough to just be able to create a beautifully bound book, it must be about something, with real content. I do a huge amount of reading on my subjects before putting anything visual together. Over time I will collect many hundreds of images that may be relevant. It could even be just a colour or a pattern that I think might fit with the design; sometimes I visit a relevant location for photographs. I make sure to give an introductory description of the content as the images may sometimes seem rather obscure; however I do rely on the finished pages to make a pleasing edition. Some of my books include images combined with mathematical formulae that need an explanation. Leslie: What first set you off on this career? Who and what are the key people/events that have helped you on the way? Jackie: I have always loved books, as physical objects as well as reading, and decided I would like to learn how they are made. I attended classes for two or three years to learn the technique, making numerous empty notebooks, and then decided I would have to make books with content. I have always been interested in ‘popular science’ – science subjects accessible for anyone. In addition, my daughter is an astrophysicist and astronomer, and her enthusiasm for the subject caught my imagination. I have visited the telescopes in Hawaii a number of times when she works there, and this amazing opportunity has definitely been inspirational, encouraging my interest in space exploration. I have made two books about the subject and no doubt will make others. I’m also fascinated by the intrepid Victorian ‘scientists’ who without any prior knowledge undertook incredibly dangerous adventures and experiments in an effort to find out about different materials, medicines, electricity and the wider world, discovering many things which we now take for granted. 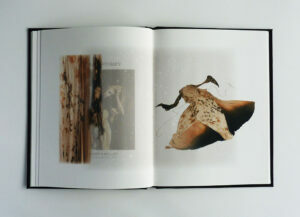 Leslie: What are the technical, artistic and imaginative processes that go into making these books? 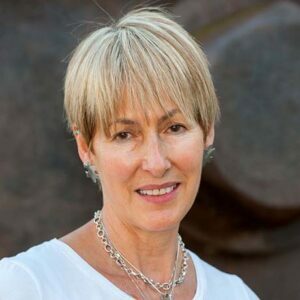 Jackie: I use design and photographic programmes, and often experiment with the thousands of options available, I also spend many hours carefully ‘cutting out’ parts of an image that I need to use. I usually have a picture in my head of roughly how a page will look, although this always changes as I progress. Once started on a page, it’s surprising how just putting images together sparks the imagination, so pages almost develop independently… you just know when it looks right. Leslie: What have you had to learn to make these books – how did you gain that knowledge? Jackie: I first learnt how to make a book in classes, creating many empty notebooks to try and get the technique correct. There are numerous different kinds of construction, but I print the pages in the studio and put them together using my preferred method of stitching and gluing. Book cloth covers are usually screen printed, or print paper covers, depending on the style of the book. 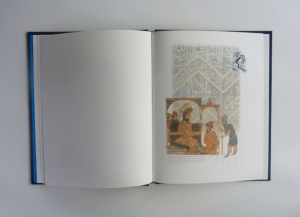 Jackie Thomas – a page from ‘Arabic Science, East to West’. Leslie: Could you pick one, maybe two, books you’re particularly proud of and explain why? Jackie: I’ve picked two completely different books as examples. The first is ‘Arabic Science, East to West’. This was inspired by a programme I heard on the radio by the scientist Jim al-Khalili. It is a fascinating subject and I discovered wonderful images with beautiful colours that I managed to extract from many sources. My second choice is a completely new and idea, a recent journey into botany. This book, ‘Plant Hunters, Explorers and Adventurers’ looks at a number of famous plant hunters, giving me the opportunity to use wonderful images of trees, plants, maps of journeys etc. 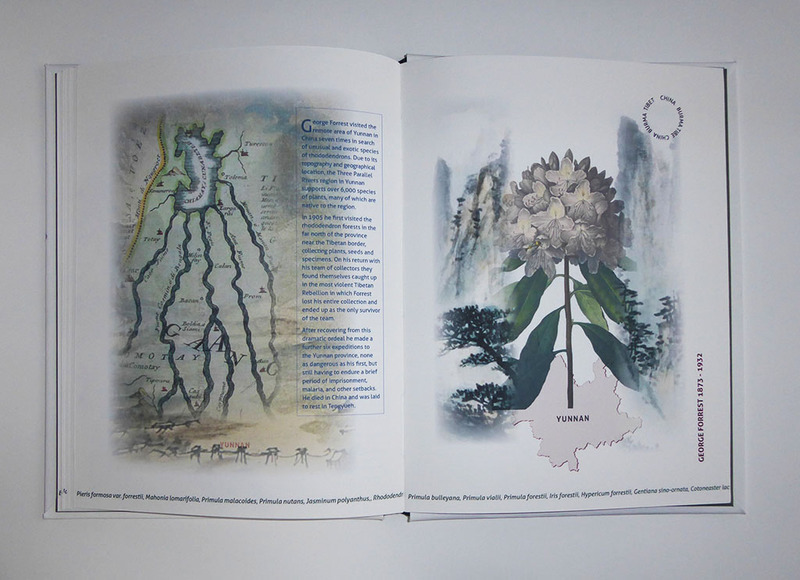 as well as finding images of drawings by great botanical artists and learning about the amazing explorers who spent years in China and the Far East looking for plants, in completed uncharted parts of the world. The A4 format, slightly larger than I usually make, gave me extra space in which to work and turned out to be a successful format. I has inspired a further edition which I am currently working on, about the prolific Prussian scientist (in many fields including botany) Alexander von Humboldt. One book often leads to another idea. The cover of ‘Plant Hunters, Explorers and Adventurers’ is printed paper, which seemed to fit in better with the subject matter than a cloth bound edition. Jackie Thomas – a page from ‘Plant Hunters, Explorers and Adventurers’. Leslie: If you work with other firms/people what do they contribute? Jackie: At the moment I mostly make my own books, but I do undertake some commissions. I’ve made poetry books, exhibition catalogues, books for presentation, and other editions for individuals who want a book for a particular occasion. Firms and people usually have a fairly fixed idea of what they would like, which is their contribution, and I have to find a way to make their ideas work, both technically and visually. I have been given a set of original paintings to turn into a book, so these were scanned, and resized of course, to fit into the desired format. Leslie: What are the personal rewards and difficulties of working in such an unusual creative field? Jackie: Personal rewards are satisfaction in the finished work. I think it is essential to be a perfectionist when creating books; I am not a fan of the homemade look with a rough finish, but that’s a personal preference. Difficulties include working out the physical structure of the book, printing all the pages the right way round, making sure the transition from one page to the next flows smoothly, and always making sure to avoid mistakes, for example attaching a book block to the cover upside down, an irreversible error! Next week Sacha Coward talks about working in museums, including building ‘escape rooms’ and running family festivals as well as staging interactive exhibitions, films and events. What beautiful creations! This is a fascinating post. Jackie takes writing, design, art, and publishing back to the heart and hands of an individual. It’s a tremendous undertaking, and her creations are superb. I’d love to see them on display. Wonderful interview! A fascinating post, Leslie and Jacquie. Such an unusual concept and so pretty too.